Google recently announced updates to the Google Assistant software that will improve the user experience. Some of the key aspects of the new updates are directed at making Google Assistant more responsive to natural speech patterns. As Swann’s home security system is integrated with Google Assistant, these updates impact the way you use your Swann security system for the better. Here are some of the main improvements Google rolled out earlier this year. Before this update, any time users wanted to issue a command to their Google Assistant, they would need to lead each question or command with “Ok Google” or “Hey Google.” The phrases activated the Assistant making it ready to respond to requests. Any request issued to the Google Assistant needed to be prefaced this way, even if there were a number of commands issued back to back. Users noted that leading off with “Hey Google,” was not a natural way of speaking (you would not, for example, address a friend by name every time you engaged in a conversation with them, especially when continuing a conversation). Google wanted for the Assistant to be able to reflect more natural speech patterns and so in May 2018, they introduced the Continued Conversation feature. When this feature is turned on, the Assistant can answer multiple requests or ask multiple questions after using “Hey Google” just the first time to initiate the conversation. This update will be beneficial for those using Swann’s Google Assistant compatible home security system as users will be able to issue multiple commands in a more streamlined way. 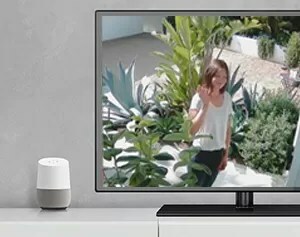 After activating your Google Assistant, you’ll be able to check multiple cameras and rooms using shortened commands such as “show me the front door,” or “show me the backyard.” Keep in mind you will have to first update your Google Assistant preferences to enable the Continued Conversation feature. Swann’s updated software reflecting the Continued Conversation update will be available in the coming months. Also released with Google Assistant’s 2018 features: The Multiple Action feature allows for Google Assistant to handle more complex inquiries, including two-part questions in the same sentence. For example, you could ask your Swann security camera equipped Google Assistant to show the front and back doors in one request and the new software updates will make it possible for the Assistant to understand and respond to such requests. As part of these updates, it is now possible to create scheduled commands that will be automated into action without prompting. The first six routines include Good Morning, Bedtime, Leaving Home, Commuting to Work, Commuting Home, and I’m Home. For example, you can set up a routine for leaving home in which your smart home cameras will be turned on at certain times. Some other updates Google rolled out this year for its Assistant include new voices with many more in the pipeline (including that of ten-time Grammy winner John Legend), making your Google Assistant more customizable. Google also announced that they have found a way to create voices through a more expedited process that does not require hours and hours in the studio recording various commands, making it easier for them to add different voices to their library. As technology upgrades are integrated into Swann’s software, smart security systems will become more customizable and efficient. Swann’s development team is working to incorporate Google Assistant’s Continued Conversation updates into our systems so that Swann’s home security users can enjoy the benefits immediately. Security is a serious matter, but that doesn’t mean it can’t be a little fun. Our team has included a few “Easter egg” surprises to add a little humor. Try asking your Assistant “Hey Google, let the dogs out” and see what happens. There are many more where those come from that you’ll just have to discover on your own! As Google continues to improve Google Assistant, Swann is committed to integrating new features and updates that will be available to customers as soon as possible. With Swann and Google Assistant, you get the cutting edge, customized, and easy to use smart home security system. Speak and now you can see! Some of the key aspects of the new updates are directed at making Google Assistant more responsive to natural speech patterns.